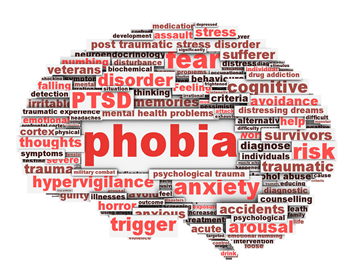 A phobia is the avoidance of a situation or place because of fear or panic when no real danger exists. One of the many functions of your human brain is its preoccupation with your continued survival. With this as its primary agenda , as we`ve seen, it scans constantly, mostly without your awareness, for potential danger. A noxious experience which occurs once, or even twice, may be ignored, but once a pattern begins to emerge, like a submarine with an unidentified blip on its radar, your mind is on the hunt for helpful clues to piece together a profile of the problem in order to formulate a solution. Like a highly efficient computer, it starts cross-referencing, linking things up, looking for trends that could be predictive for the future, tip-offs in advance of the event which might provide you with that little edge that would warn you to avoid it in time. Policies form quickly. So a few dodgy tummies after certain types of spicy food, one let-down too many by a certain person, or one inefficiency too many by a certain travel agency and your mind has the solution – AVOID. Not for anything would you put yourself in the way of that again. A sensible decision, most would agree. This avoidance policy is the basis of how phobias form. A panic attack, or even the lead-up anxiety, begins to be firmly associated with a certain situation or object as the trigger – lifts, dogs, spiders, sight of blood, dental work, heights – the list is endless. If the experience is repeated often enough, you develop a dread of it occurring, and you begin to divide your world up into safe or dangerous places, depending on the likelihood (according to your minds reckoning as opposed to reality) of encountering the triggering situation. Research shows that phobias come into being by three possible pathways. Direct Conditioning – first-hand experience, such as being repeatedly terrified by panic attacks, or bitten by a dog, or nearly drowning. Vicarious or Observational Conditioning – witnessing another person experience an attack by a dog or repeatedly watching someone who becomes paralysed with fear when they see a spider. Information / Instruction Conditioning – Being cautioned about thunder storms, or warned to be vigilant of creepy-crawlies lurking in the long grass, or reading information suggesting that dogs can be prone to attack without reason. Extract from WHEN PANIC ATTACKS, author Dr Aine Tubridy.